Update March 13, 2013: Looking for individual cards to print out and give to each guest at your baby shower? 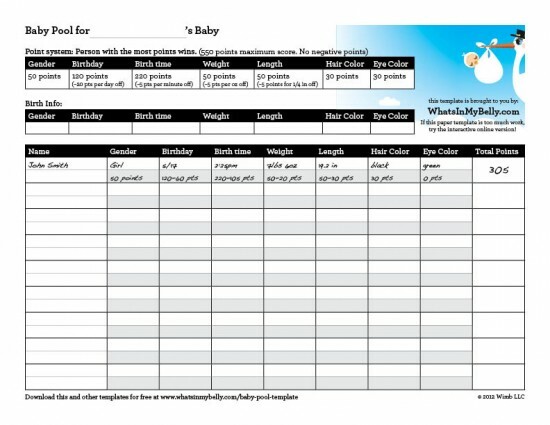 You might like our printable baby prediction cards. Update Jan 21, 2013: You can now use this paper template to gather predictions and enter the guesses on the website without asking people to sign up and enter the guesses on their own. Check out this post for details on the new feature. At whatsinmybelly.com we have one goal: make great tools for expecting parents. When I started this website I wanted to make it as easy as possible to setup and run a baby pool. I think most people will want to use our website over the traditional baby pool organized with good ol’ pen and paper. But in a world with 6.8 billion people, there has to be a few people out there who want to run a baby pool the old fashioned way. And according to Google there are about 1,600 searches for “baby pool template” every month. So, for those of you who prefer to print and write, here is our first printable baby pool template in PDF format. Now, there are many ways to run a betting pool of any type, and baby pools are no different. This particular template is set up to use a similar model as our baby pool website. 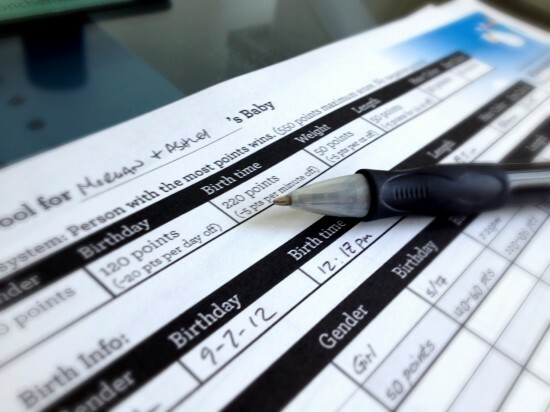 It’s point-based: each of the baby’s stats (gender, birthday, time, weight, etc) earns points, so the closer your guess on each stat, the more points you earn. The person with the most points wins. Other people prefer a date/time grid and I’ll create a template for that style soon. How do you prefer to run a baby pool? Leave a comment to this post describing your preferred method and I’ll create a template that fits your style of baby pool. So, if I’m reading correctly… for the time.. if your more than 44 minutes off you just get zero points since you noted no negative points?? so you can possibly get the date right but then receive no points because you were so off on your time guess… right? Date and Time points are issued separately. If you get the date correct, then you would get the 120 points. Separately, if the time is off by more than 44 minutes, then you receive 0 points for that piece. Your total would be 120 points. As for negative numbers, that’s up to you. Out printable templates are designed to get you started. All of our “rules” are really just suggestions. You can make the game as wild and crazy as you want. Just have fun! Every time I try to open the baby pool printable template its just a bunch of mumbo jumbo?? I cant get the template? Megan, sorry to hear you’re having trouble with the printable template. Its a PDF file so it should open without an issue. Have you tried right clicking the link and downloading it and then opening with a PDF reader? Usually if you are doing this Baby Pool does each person contribute money? Same amount for all people? And the winner wins the money or how does this work.. is there anything for the winner? Maybe half goes to baby half goes to winner? Alyssa, we (WhatsInMyBelly.com) don’t facilitate any financial transactions since gambling is illegal, but what you do privately is your call! We have seen a lot of parents offer up prizes for the winner. We’ve also seen people put a few bucks on each guess and split the pot with the baby. That’s a great way to kickstart a college savings! Have fun! How do I access the “Online interactive version?” Thanks for such a great tool!! Hi Marquez. To access the online version just go to whatsinmybelly.com and click the green “Sign Up Free” button. do you have a pool for twins? You will have to create separate pools for twins. How can i access this template to type in it?? Click the link that says “Download baby pool template”. It is a PDF file you will need to print it and then write on the printed form… I know – old school! Thanks for doing this. Can you tell me how to make one like this, only without the Hair Color and Eye Color Columns? June, we seem to get that request a lot. I think we’ll have to create a new version of the printable and the website! This is so wonderful. Thank you for creating this!!! Are all the scores automatically figured once we put in the information after the baby arrives? Karen, yes, the scores are calculated automatically if you used the online game at whatsinmybelly.com. Obviously, if you use the printed templates and don’t enter all the guesses online, then you’ll have to do the number crunching on your own. Good luck!